The primaERP team supports and is responsible for the translation of these languages: English, German, Spanish, Portuguese, Russian, Czech and Slovak. 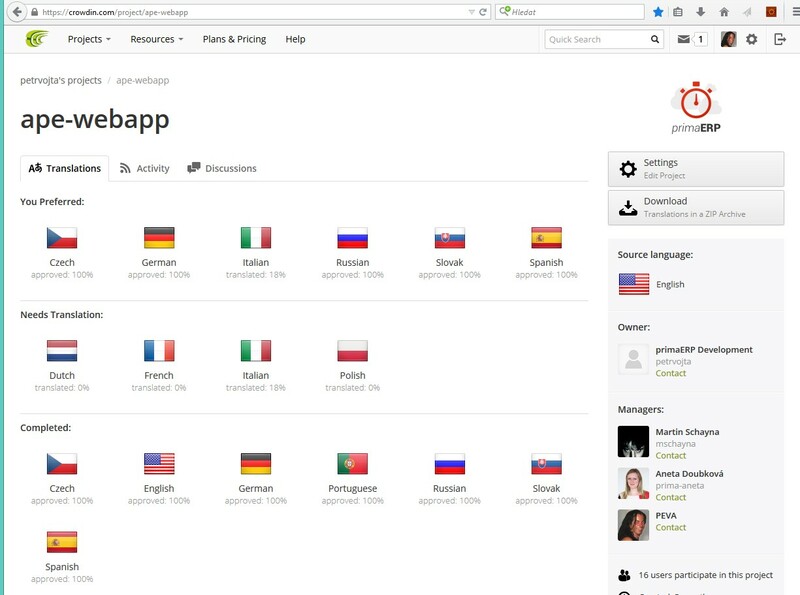 Besides these languages, it is now possible that users, who are interested in having the app in other languages, can participate and help us translate primaERP. We call them 'unsupported' languages.If you are interested in helping us translate, please contact our support and then follow the instructions below. 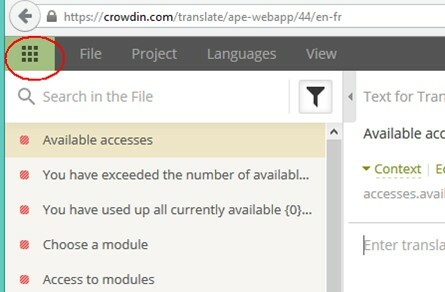 After you contacted us, we will send you an invitation to the Crowdin tool, a web/cloud-based translation tool that we use for all of the translations in primaERP. The source language is English, the destination language for you is <your unsupported language>. While translating, you can also see the text (string) in the different languages. In addition, the machine always suggests you a translation, which can be very helpful. I fit is correct, you can just copy and use it, or modify it slightly. You will see, translating the app is quite easy. 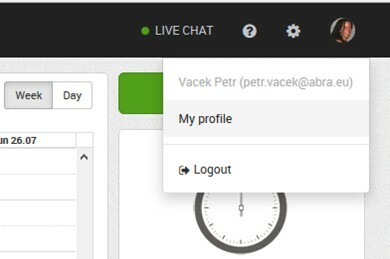 Once you receive the invitation e-mail, register to the Crowdin tool and save your login information for later use (username and password). I recommend to you to start with the first one. There you can see what the text is and in which context, while the second one is good to use to finish some translations you missed and after you are more familiar with the app. 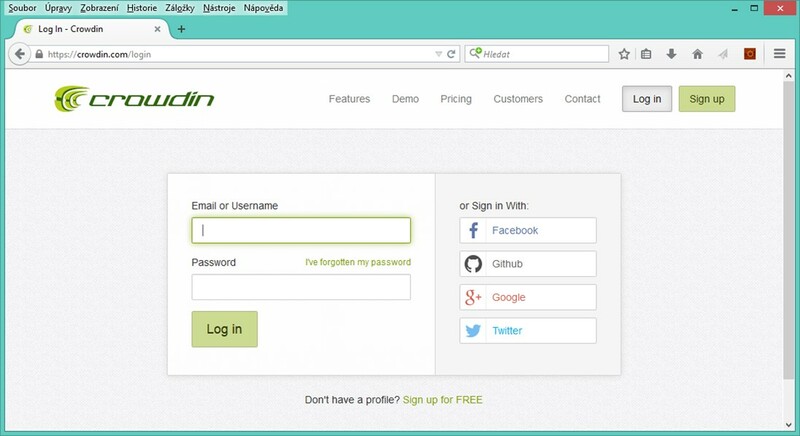 Open up your primaERP account in your browser and log in. Then click on the avatar in the top right corner of the screen and click on your profile. Now go to the languages and you will see the list of available languages, as well as the "unsupported languages" (seen in red). Choose your unsupported language, save it and go back to the calendar. 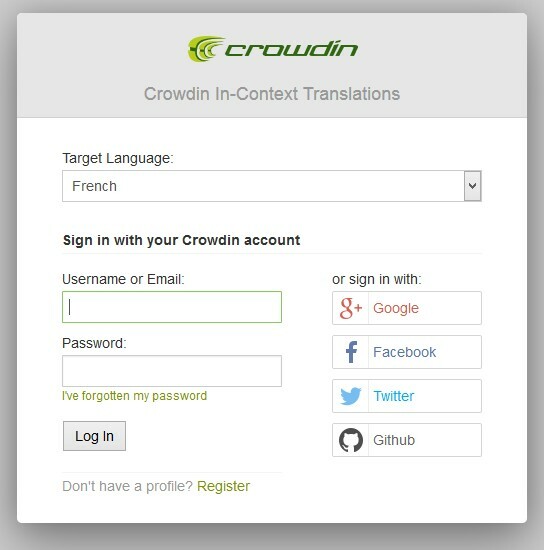 Select your unsupported language and enter your login data for crowdin. 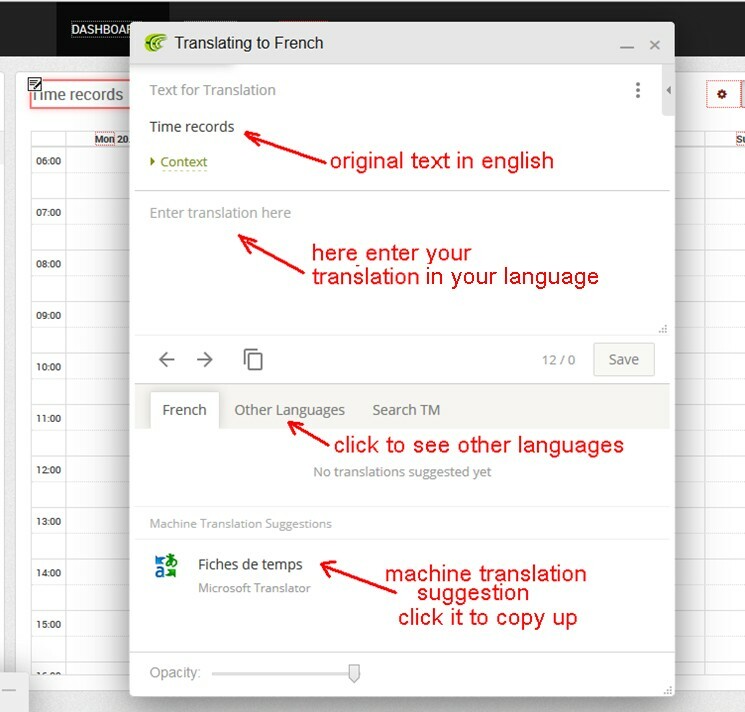 You can write the translation in your language by hand or click on the machine translation and it will be copied to the field above – there you will be able to modify it. You can have a look at the page ‘Other languages’ and see the translation in German, Spanish, Portuguese, Czech, etc. When your translation is written and correct, click the Save button in the middle. If there is some text to follow, this will automatically appear after saving the previous one. Just continue translating. If you close the dialog (after saving of course), you will see your translation directly in the app. The app is live, so you can click any menu item, icons, setting dialogues or any other boxed texts and translate them. This way you can quickly translate the most used texts, which are visible at first sight in the app’s screens and dialogues. Of course, there is a lot of other texts, which are not seen immediately. For those, you can use the method number 2 described below. Important! - Your translations in the unsupported language (Dutch/French...) are only visible in the app in this method (with ?lang=zu_ZA). For everyone else, who doesn't have access to Crowdin (so colleagues or other users), these changes will not yet be seen. Your translation for normal users will be available after we have updated the new version and published it for public. This is done usually every 2-3 weeks. Click on the flag of your unsupported language. The progress bars show for each group, what the process is. If you already translated some text using the first method, you should see some percentage of translations completed. Choose any of the groups (I recommend to start with General messages for example) by clicking on the name. 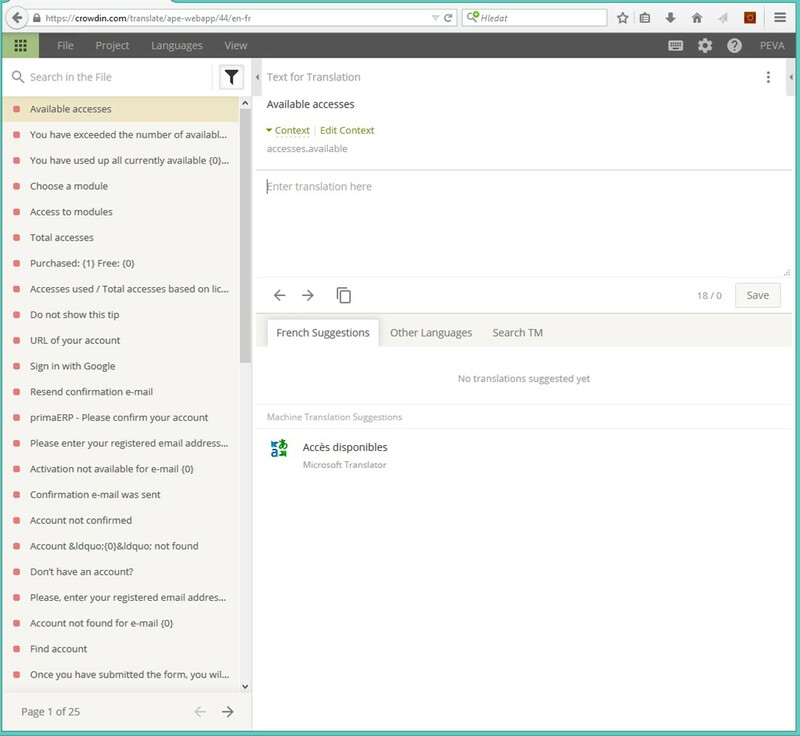 On the left side you can see all of the texts, which need translation. The right side is the same as it is in the first method. 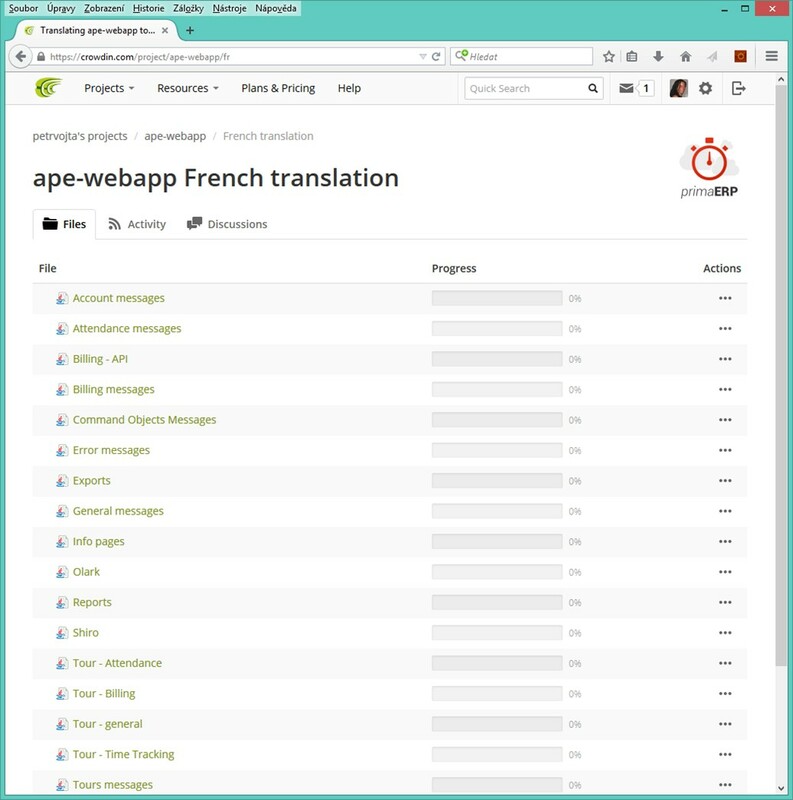 After you translate the text, the red square on the left becomes green and the next one in the list is automatically offered to translate. You can of course click on any other in the list. By default, the ‘Untranslated’ filter is applied, which is why you see only untranslated texts in the list. You can also search specific text using the search box left to the icon. By clicking on the green icon in the upper-left hand corner, you can go back to the main page (the list of groups) and see the percentage of the groups already translated. 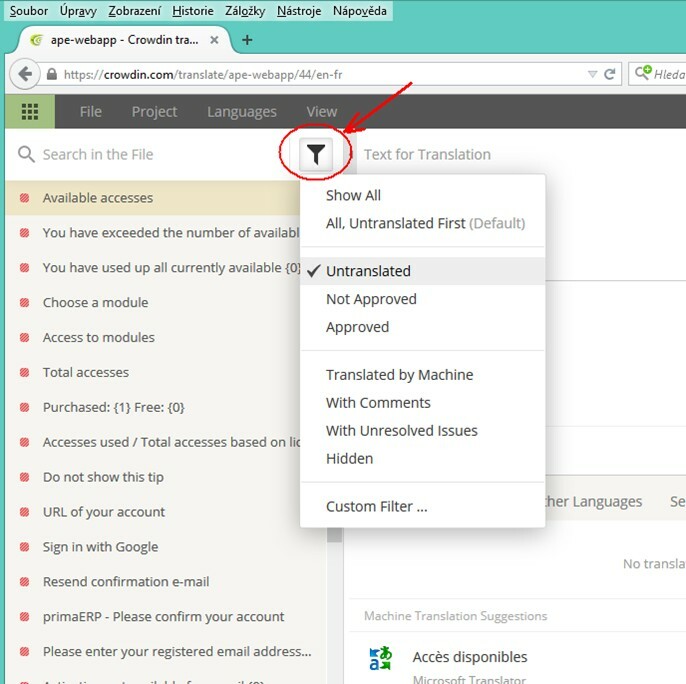 There is also tool for approving the translated text, but don't worry about that right now. 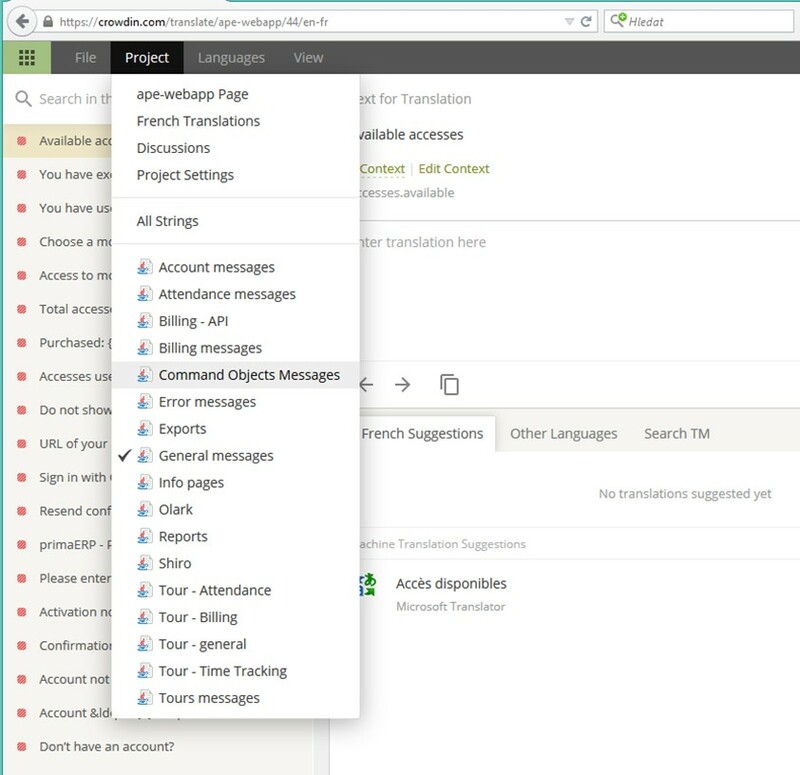 When your translation will be ready (or every time before releasing a new version of primaERP), we will notify you and then approve all of your translated texts to put them in the version. 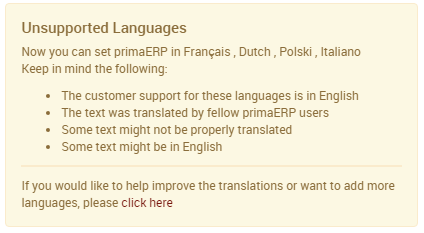 Thanks for your help and we're looking forward to have primaERP in your language!